Dallas Personal Trainer - One of the best upper body presses ever invented and yet largely underutilized by Dallas personal trainers. This exercise (if properly performed) teaches the lats and chest to contract the shoulder girdle down into its most stable position, making it easier to safely and effectively perform exercises such as the bench press, pushups, flyes, etc. 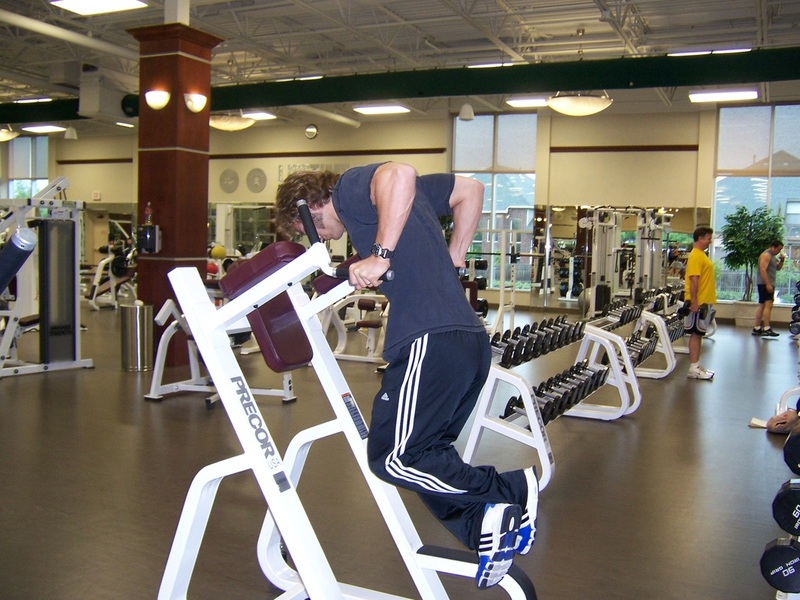 These can be performed on regular dip bar, or on an assisted chin-up/dip machine, with counter resistance helping you. Eventually, you may even get strong enough to do these with added weight. Almost everyone will have to start out on the assisted machine, as this is a difficult exercise to perform with one's total bodyweight. The assisted machine will assist you in the amount that you select on the weight stack. You are not lifting this weight, this weight is counterbalancing your bodyweight to assist you in lifting. For example: If you weigh 250 lbs. and you select 160 lbs. 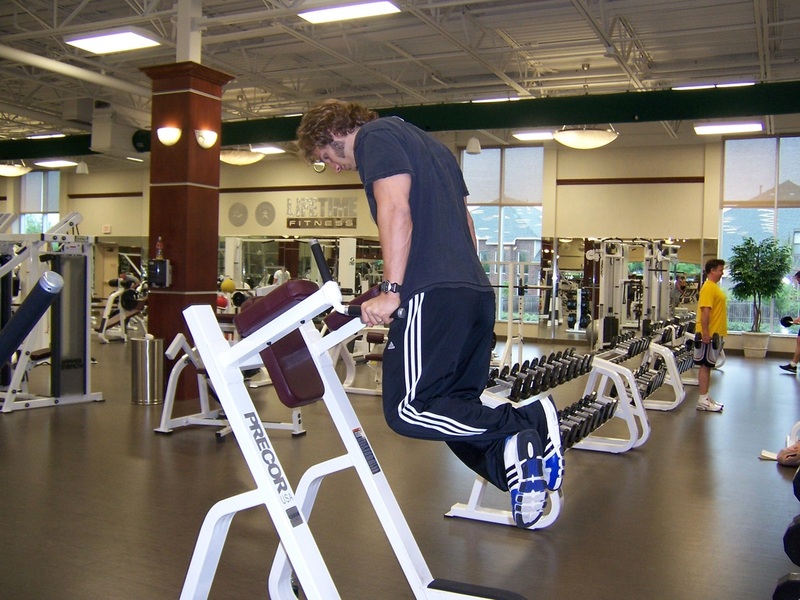 on the assisted dip machine, you are lifting 90 lbs of your own bodyweight (250lbs - 160lbs = 90lbs). Begin from the up position with your arms straight. Lean your torso forward, keep your head down, and bend at the hips and knees. Tuck your knees forward slightly, letting them hang below your torso. Lower yourself by bending at the elbows and shoulders while keeping your head down, your torso leaned forward, and your armpits tight. Lower yourself until your upper arms are parallel with the floor. Without bouncing at all, smoothly press yourself back up with your chest muscles. Keep your armpits tight, your head down, and your torso leaned forward as your press yourself back upward. When you reach the top, squeeze your chest muscles tightly and then lower yourself back down smoothly for the next rep. Sometimes (especially when you get tired) it may be tempting to lift your head up, stick your chest out to the front, and lean back. Do not do this. Sloppy exercise technique is a great way to get injured. When in doubt, reduce the amount of weight you are lifting in order to keep your form tight. Keep your torso leaned forward, keep your head down, and keep your armpits tight throughout this entire exercise. If you cannot do dips with your own bodyweight and you do not have access to an assisted chin-up/dip machine, simply replace this exercise with Dumbbell Bench Press.